The production of low cost and environmentally friendly high performing carbon materials is crucial for a sustainable future. 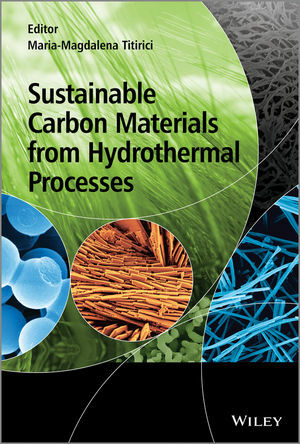 Sustainable Carbon Materials from Hydrothermal Processes describes a sustainable and alternative technique to produce carbon from biomass in water at low temperatures, a process known as Hydrothermal Carbonization (HTC). Sustainable Carbon Materials from Hydrothermal Processes presents an overview of this new and rapidly developing field, discussing various synthetic approaches, characterization of the final products, and modern fields of application for of sustainable carbon materials. Sustainable Carbon Materials from Hydrothermal Processes will serve as a comprehensive guide for students and newcomers in the field, as well as providing a valuable source of information for researchers and investors looking for alternative technologies to convert biomass into useful products. Maria-Magdalena has been working in the field of hydrothermal carbonization (HTC) since 2005. Her laboratory at the Max-Planck Institute of Colloids and Interfaces has been driving the renewed interest in HTC for the production of high-tech carbonaceous materials. Since 2005 she has published more than 40 scientific papers on this topic, including 2 reviews, as well as a book chapter.